As you read the sub-sub title above, you know why this book has been a bestseller, available even at Costco, where everyone can pick it at deep discount. Who doesn’t want to know what really happened in the raid on Osama Bin Laden’s compound? Mark Owen—a pseudonym, meant to protect the mission, although Owen’s real name is very easy to find online—was there. And he gives the reader all the thrilling, frightening details of the night Bin Laden was killed and its aftermath. You can follow the story by studying the accompanying illustrations of the compound showing who was in which building and where one of the helicopters crashed at the outset of the mission. It’s heart-smacking stuff. But before Owen gets to that story, he details the long history of his life as a Navy SEAL—of becoming a member of SEAL Team Six, of the many missions he participated in, including the rescue of Richard Phillips, captain of the Maersk Alabama, which was captured by Somali pirates in 2009. Most of his service is the grind you’d expect it to be, with details on all the equipment special service members use, on how they store and pack it, on the patterns of their training, and how they develop friendships among their members. I’d like to say that all of that description is breathtaking stuff because—well, who doesn’t want to have nothing but praise for a hero? But the truth is that I think those many chapters before the Bin Laden raid will have the most appeal to teens thinking about service to the country—whether in special forces or not. I think it’s OK to tell the truth and say that much of this is pedestrian stuff. I probably should have read it in a few sitting, but I kept walking away from it, starting (and finishing) another book, then coming back. I made the mistake of not looking through the photos of military equipment, such as guns and helicopters, that are in the middle of the book until I read to the middle. I suggest you look at these and read the descriptions before starting the book. 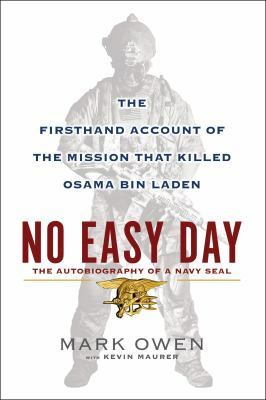 I ended up liking No Easy Day as a whole because the truth is that being a hero isn’t something that happens overnight. The fact that Owen went through years of training, some of it grueling (some of it boring), and also had to be in the right place at the right time before he could participate in the mission are important things to know. If you think you can just walk into military service and do this sort of thing, then you must read this book for a reality check. Lots of preparation for big events (and I’m thinking in any walk of life, not just military) is about being willing to slog through the training and practice. Owen is grateful for the service of many elite forces—the SEALs and others who work with them, such as EOD specialists. He is donating much of the proceeds from the sale of this book to organizations that help these folks, such as the All in All the Time Foundation. And he gives us ideas of how we can support our troops—ideas that beat the heck out of throwing a yellow ribbon magnet on the back of the car and calling it a day. This entry was posted in Adventure Stories, Biography/Memoir, Historical Fiction/Historical Element, Non-fiction and tagged Adult books for teens, autobiography, book reviews, military, Navy SEALs, Osama Bin Laden, Special Forces, terrorism. Bookmark the permalink.